The global solar photovoltaic (PV) materials market has gained significant momentum over the last few years. The rising concerns over various environmental problems, especially greenhouse gas emission and the increasing carbon footprint, have surfaced as the main factor behind the growing demand for solar PV and, consequently, solar PV materials across the world. The research activities for the innovation and development of new materials with low manufacturing cost and power conversion efficiency is increasing at a faster rate. Going forward, the government stringent rules and regulations, increasing investment in renewable energy generation, and the reducing dependency on fossil fuels are anticipated to drive this market substantially in the years to come. The opportunity in this market was US$7.55 bn in 2015. Rising at a healthy CAGR of 11.4% between 2016 and 2024, it is anticipated to reach US$19.60 bn by the end of 2024. The Middle East and Africa, North America, Europe, Asia Pacific, and Latin America are the prime regional markets for solar PV materials across the world. In 2015, Asia Pacific emerged as the key contributor to the global market with a share of nearly 60%. Thanks to the high demand for solar photovoltaic installations in the power industry and in generating electricity from renewable sources, the Asia Pacific market for solar photovoltaic materials is expected to remain on the top over the next few years. China is the key domestic market for solar PV materials in Asia Pacific. North America is another significant regional market for solar PV. On account of the exponential growth in the power industry in terms of renewable energy generation, North America is anticipated to witness an increasing demand for solar PV materials in the near future. The markets for solar PV materials in Europe, the Middle East and Africa, and Latin America are also expected to exhibit stable growth over the next few years. Crystalline, polycrystalline, cadmium telluride, and copper indium diselenide are the key materials available in the global market for solar PV materials. Among these, the demand for polycrystalline is higher than others and this scenario is expected to remain so over the next few years. Polycrystalline silicon acquired a share of more than 72% in the overall market in 2015 and is anticipated to witness a significant rise in its demand in the near future due to its cheap manufacturing process as compared to that of other materials. Crystalline silicon is also experiencing considerable demand across the world. However, the high cost associated with it may act as a limit force in the years to come. Cadmium telluride and copper indium diselenide are cheaper and have less power conversion efficiency. Market players are performing research to increase their efficiency. Due to the presence of a large pool of participants, the global market for solar PV materials displays a highly fragmented competitive landscape. BASF SE, Mitsubishi Material Corp., Hemlock Semiconductor Corp. LLC, LDK Solar Co. Ltd., Okmetic, Wacker Chemie AG, Applied Materials Inc., Shin-Etsu Chemicals Co. Ltd., Atecom Technology Co. Ltd., Topsil GlobalWafers A/S, Silicor Materials Inc., and Targray Technology International Inc. are some of the prime vendors of solar photovoltaic materials across the world. Solar photovoltaic materials are the materials that are used in manufacturing of solar panels or modules which are installed for generating electricity. Solar photovoltaic materials are basically of two type’s crystalline and thin film. Crystalline is further divided into polycrystalline and gallium arsenide whereas thin film is of three types’ namely amorphous silicon, cadmium telluride, and copper indium diselenide. Out of all the solar photovoltaic materials, polycrystalline is the most dominant material because of its good efficiency and easy manufacturing process. Thin film materials like cadmium telluride and copper indium diselenide is expected to grow in the near future. 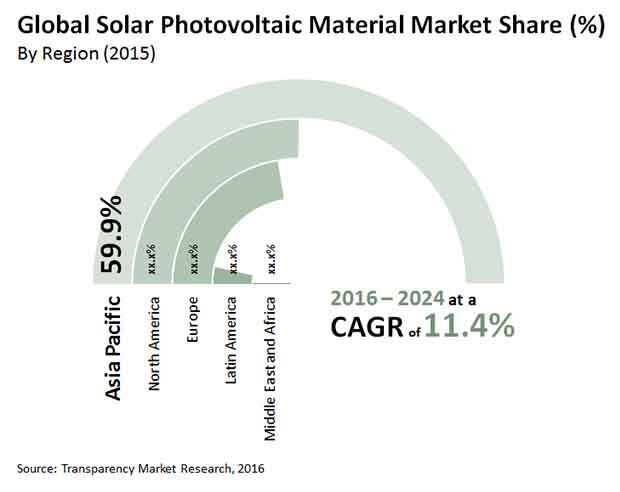 The report estimates and forecasts the solar photovoltaic material market on the global, regional, and country levels. The study provides forecast between 2016 and 2024 based on volume (kilo tons) and revenue (US$ Mn) with 2015 as the base year. The report comprises an exhaustive value chain analysis for each of the product segments. It provides a comprehensive view of the market. Value chain analysis also offers detailed information about value addition at each stage. The study includes drivers and restraints for the solar photovoltaic material market along with their impact on demand during the forecast period. The study also provides key market indicators affecting the growth of the market. The report analyzes opportunities in the solar photovoltaic material market on the global and regional level. Drivers, restraints, and opportunities mentioned in the report are justified through quantitative and qualitative data. These have been verified through primary and secondary resources. Furthermore, the report analyzes substitute analysis of solar photovoltaic material and global average price trend analysis. The study provides comprehensive view of the solar photovoltaic material market by dividing it into end-user and geography. The solar photovoltaic material market has been segmented into crystalline, polycrystalline, cadmium telluride, copper indium diselenide and others. End-user segments residential, commercial, and industrial have been analyzed based on historic, present, and future trends. Regional segmentation includes the current and forecast demand for solar photovoltaic material in North America, Europe, Asia Pacific, Latin America, and Middle East & Africa (MEA). Additionally, the report comprises country-level analysis in terms of volume and revenue for end-user segments. Key countries such as the U.S., France, Germany, Italy, the U.K., China, India, Japan, South Africa, Mexico, and Brazil have been included in the study. Market segmentation includes demand for individual end-users in all the regions and countries. The report includes Porter’s Five Forces Model to determine the degree of competition in the solar photovoltaic material market. It comprises qualitative write-up on market attractiveness analysis, wherein end-users and countries have been analyzed based on attractiveness for each region. Growth rate, market size, raw material availability, profit margin, impact strength, technology, competition, and other factors (such as environmental and legal) have been evaluated in order to derive the general attractiveness of the market. The report comprises price trend analysis for solar photovoltaic material between 2016 and 2024. The report covers detailed competitive outlook that includes market share and profiles of key players operating in the global market. Major players profiled in the report include BASF SE, Mitsubishi Material Corporation, Hemlock Semiconductor Corporation LLC, LDK Solar Co. Ltd., Okmetic, Wacker Chemie AG , Applied Materials, Inc, Shin-Etsu Chemicals Co., Ltd., Atecom Technology Co., Ltd., Topsil GlobalWafers A/S, Silicor Materials, Inc., Targray Technology International, Inc. Company profiles include attributes such as company overview, number of employees, brand overview, key competitors, business overview, business strategies, recent/key developments, acquisitions, and financial overview (wherever applicable). Secondary research sources that were typically referred to include, but were not limited to company websites, financial reports, annual reports, investor presentations, broker reports, and SEC filings. Other sources such as internal and external proprietary databases, statistical databases and market reports, news articles, national government documents, and webcasts specific to companies operating in the market have also been referred for the report. In-depth interviews and discussions with wide range of key opinion leaders and industry participants were conducted to compile this research report. Primary research represents the bulk of research efforts, supplemented by extensive secondary research. Key players’ product literature, annual reports, press releases, and relevant documents were reviewed for competitive analysis and market understanding. This helped in validating and strengthening secondary research findings. Primary research further helped in developing the analysis team’s expertise and market understanding.